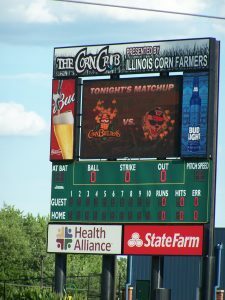 A unique, corn-themed semi-pro baseball team has harvested a large crop of followers during their nine years of existence in the central Illinois community of Bloomington-Normal. The Normal CornBelters of the historic Frontier League has played for nearly a million fans since general manager Steve Malliet joined forces with the Illinois Corn Marketing Board (ICMB) to create the ball club, and its signature 4,000-seat stadium dubbed “The Corn Crib,” in 2009. Malliet, who began his baseball journey in the front office of the Wisconsin Timber Rattlers, a Class A Major League Baseball-affiliated team, said the key to the success of the CornBelters franchise is largely due to a focus on family-friendly entertainment other than the game, during the game — a perspective he gleaned partially through his association with Mike Veeck. Veeck, a former owner of the Chicago White Sox and son of baseball entrepreneur Bill Veeck —who planted the ivy on the outfield wall of Wrigley Field and added a fully-functioning shower in the Comiskey Park bleachers — first encouraged Malliet to come to the twin cities and help establish a Frontier League ball team there. A CornBelters game offers traditional minor and semi-pro league baseball stadium between-inning entertainment such as 50-50 raffles, bat-spin contests, T-shirt tosses and faux sumo wrestling matches. 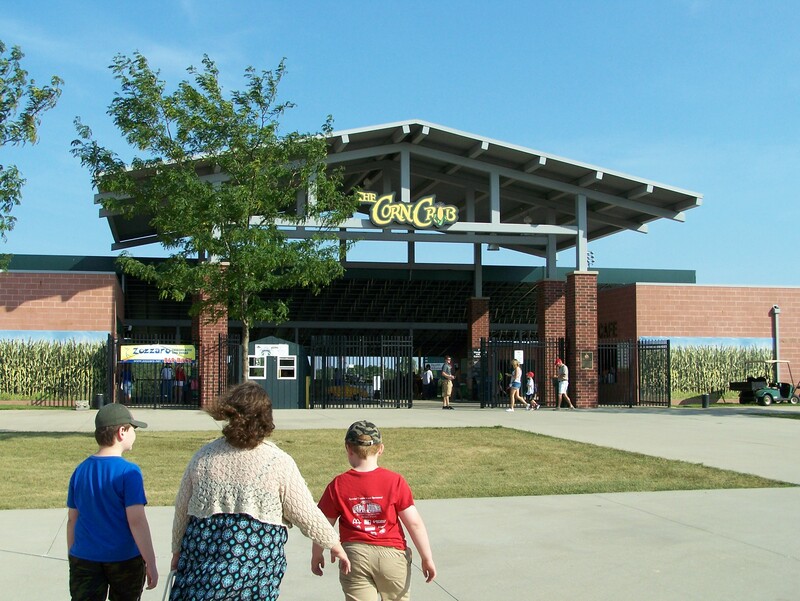 The team’s mascot Corny, who makes over 200 community appearances per year outside the confines of the Corn Crib, makes rounds of the ballpark and poses for photos with families. “The kids will be entertained in a totally safe and enclosed environment,” said Malliet. “You can feel safe to let them run off and burn some energy before their next cotton candy. In addition, players are more accessible than their big league counterparts. “You’ve got a much better chance of getting an autograph here than at a major league game,” Steve said. 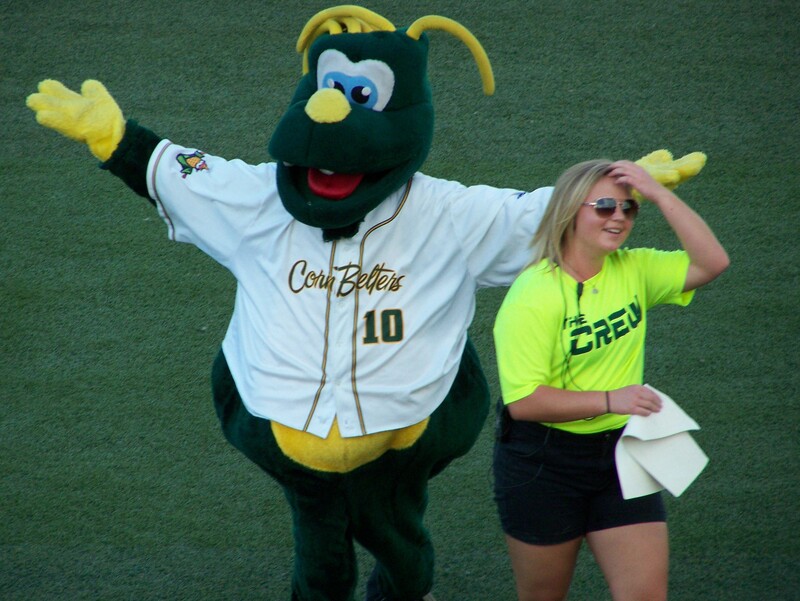 From in-house fundraising opportunities for non-profits to their long list of community partners, the CornBelters’ involvement with worthy local causes is impressive. Youth clubs, sports teams and groups supporting a cause or goal can achieve fundraising through the team’s ticket sales program or by volunteering their group to work concession sales. Community partners benefit through Community Spotlight Games that allow businesses and charitable organizations to promote themselves and showcase their good deeds throughout the community. In 2018, the CornBelters partnered with The Miracle League, YMCA of McLean County, Wishbone Canine Rescue, 4-H of McLean and Woodford counties, Relay for Life and the American Cancer Society, Marcfirst of McLean County, and the ALS Association. “You need community buy-in, and if the community doesn’t fall in love with the ball team, you have no chance of survival. It’s important that we’re involved,” Malliet explained, adding that the local Relay for Life utilized the Corn Crib to raise $250,000 for cancer research last year. The Miracle League, a non-profit that provides opportunities for kids with disabilities to play baseball on a modified ballfield located next to the ‘Belters’ stadium, benefits from a nightly 50-50 raffle at the games. The organization also is the beneficiary of proceeds from the annual Legends Game, which attracted 3,500 fans to the Corn Crib on Aug. 4 to watch a group of ex-Cubs and Cardinals players stage a benefit softball game and sign memorabilia. “It’s great to be able to utilize a resource we have, the Corn Crib, to make a huge difference,” Malliet said. 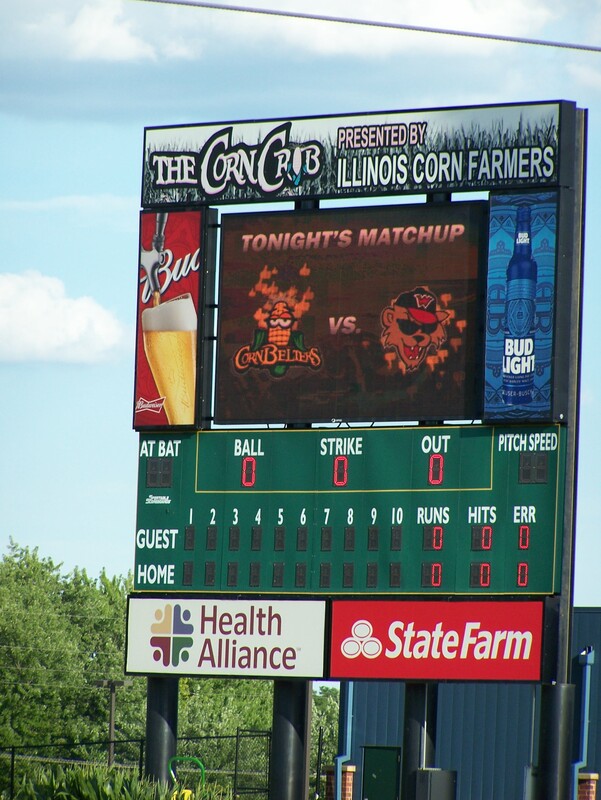 The decision to name and market the team and stadium around Illinois’ traditional number-one cash crop, corn, was an easy one to make, according to the team’s president and the Illinois Corn Marketing Board. Malliet is friends with Adam Nielsen of the Illinois Farm Bureau, located in Bloomington, who introduced Steve to ICMB farmer-leaders interested in finding a way to promote agriculture and the benefits and uses of corn to the public. “We never really had much conversation with anyone else,” recalled Malliet, who, after his stint with the Timber Rattlers, went on to work in the front office for the Milwaukee Brewers (MLB), River City Rascals (Frontier League), Myrtle Beach Pelicans (independent) and Joliet Jackhammers (Northern League) before answering the call from Veeck and moving to Normal. “We hit it off instantly and we understood what it was they wanted to achieve. A lot of people don’t know about corn and what it does for them and the community, and how instrumental it is to our economy and the state’s. It’s been a wonderful partnership for almost 10 years,” Malliet said. Though the 2018 Midwest League season is drawing to a close, there are still several home dates for fans to consider attending, including fan appreciation Sunday on Labor Day weekend, when the season comes to a close amidst a flurry of promotional giveaways that include concession and ticket vouchers, and gift cards and merchandise donated by area businesses. Tickets to an upcoming Snoop Dogg concert at the Corn Crib will be among the big-ticket items up for grabs. Malliet and the ‘Belters’ front office are very excited about the 2019 season, which will feature a yearlong celebration of the team’s 10th anniversary. “We are planning on 10-year T-shirts, hats, mugs, and other souvenirs. And we will welcome our millionth fan through the gates sometime early in the 2019 season, so we will have something special planned for that,” Malliet promised. 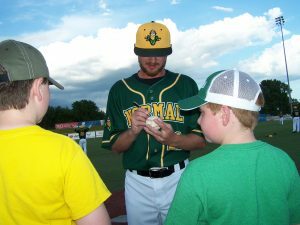 To learn more about the CornBelters and check out the remaining schedule, visit www.normalbaseball.com or call (309) 454-BALL.